These nightstands are so very well made. Frankly, I was shocked when I unwrapped them from their very sturdy shipping boxes. Did I buy something this high quality? Well, I guess I did and I am thrilled! Everything about them deserves the 5 star rating. Beautiful and very classy. Update your traditional bedroom decor with this modernized nightstand. Constructed from a durable wood and MDF blend, this piece features three full-extension drawers for all of your nighttime necessities. Choose from four colors to complement your color palate. Poor Quality vs. Poor Shipping? 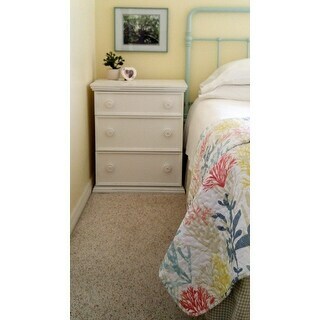 I ordered two Notting Hill nightstands in blueberry. The style is a perfect fit with my coastal cottage decor. The color is almost navy, which is perfect. That is where the perfection ends. I guess much of the product is plywood, which is a quality issue exacerbated by poor shipping and handling. The shipping boxes had a number of tears and dents in them. 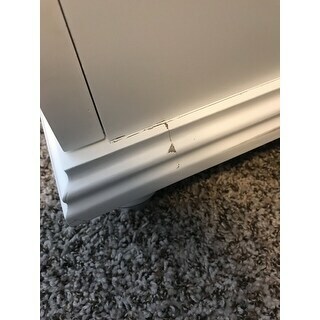 Once unpacked, most of the nightstands' corners were found to be crushed and one drawer front had a crushed spot along the side. I would send the nightstands back, but the styrofoam packaging practically disintegrated when I removed the products from the dilapidated boxes. Thus repacking and shipping are virtually impossible. So now I am off to the craft store to buy paint to touch up the crushed places. Since the items are a dark color, I hope my husband won't notice. Otherwise he would almost certainly demand that I return them. Most of my home is furnished in refinished antiques and vintage pieces. I guess I will stick to antique and vintage shops in the future. I probably won't purchase large items from "O" anymore. It was delivered in perfect shape (first one was returned because one drawer "reveal" - space between it and the upper drawer - was off). The packaging was so snug, it was difficult to pull out of the carton, lol. 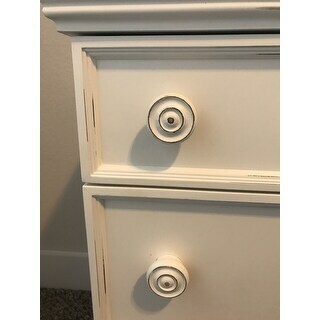 I purchased the white and while the description states "bright white", I would characterize it more like a winter white; definately not cream or off-white as is typical with distressed finishes. It has very light distressing, a little more on the knobs. I chose to not install the "feet" and it looks great. I gave it four stars only because there is a distinct smell when you open the drawers. Not necessarily a chemical smell but something more on par with how cedar closets have a strong, noticable smell. Can't identify what the smell is...another reviewer commented that they aired the drawers out before using. I haven't tried that but I've had the night stand for almost three months and use it regularly, but the smell is still noticable. Other than that, I love the unit and am considering the long dresser next! THIS IS SUCH A QUALITY PIECE . IT HAS METAL DRAWER GUIDES! I ORDERED ANOTHER! Came fully assembled. My caught wanted red and this was a re I could live with! I recently redecorated my master bedroom and needed to replace the nightstands. I didn't want to spend a fortune, and ended up taking a chance on these. So glad I did! 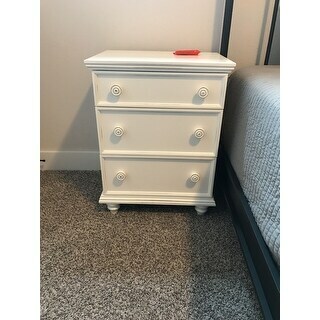 perfect size, nice large drawers and a wonderful price. The only negative I can think of the "distressing" is hardly noticeable. I fixed that by adding a little distressing of my own. Completely happy with my purchase. I purchased two of these night stands for my beach home. Of all the furniture i have, this is one of my favorites and people visiting comment on how wonderful they are. Best of all, in the small bedroom it is used, the drawers give people space to put things away. Thank you Overstock! Very good quality and color. Exactly same color as pictured. I needed 30 inch tall nightstands with adequate depth for the master bedroom. These nightstands are lovely. They’re a perfect height with a beautiful style! I ordered two of these, both came well packaged and were not damaged in shipping. 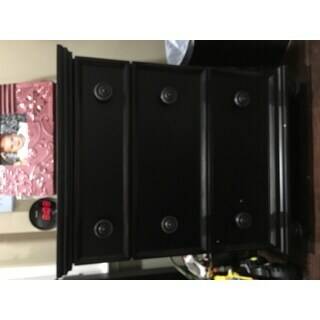 They are very nice quality for the price with the drawer glides and pretty white finish. heavy well made nightstand. I needed a taller piece & this is perfect. Color is black with a bit of distressing. Be certain you read the dimensions carefully. Great nightstand - came assembled just had to add the feet. It did arrive damaged- see picture. Not enough to fuss over and resend this thing back. Damaged shown in final photo. I bought this nightstand to replace a fading older one. It is a perfect match for my black bedroom set. Note that it is not very wide, so it is good for tight spaces. 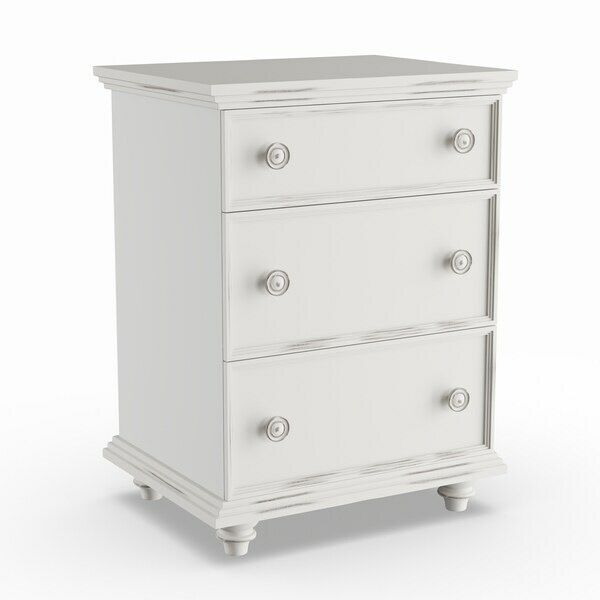 I ordered two of these nightstands for either side of my king bed. They are very heavy -- the white is a bright white. No installation necessary except the legs. Be aware that the legs are in the bottom drawer -- very easy to install. Love that it came assembled, very well made and sturdy piece. Have had for 4 months now and no issues. The drawers hold a lot for a nightstand and just purchased another. This is by far my favorite piece of furniture that I have purchased from overstock.com. It is extremely high-quality and beautifully finished. It was delivered on time and in perfect condition. I sincerely could not be happier with this piece which has caused me to order five more pieces from Overstock because I was so happy with the first one. Highly highly recommended! Ordered this for my granddaughter’s room. It sits next to her bed and matches the dresser I got from Overstock perfectly. She loves it! I love these nightstands! The finish is kind of a chalky white and slightly distressed. The quality of the drawers and cabinet are very nice for the price. I looked at so many nightstands and am so happy I chose these! These were purchased for one of our guest rooms. I LOVE THEM. They look great and they are well made. I had glass cut to put over the tops to protect them. Bought 2 of these in navy. They look beautiful and are well made. Not the cheap stuff, these are real wood! Would highly recommend, especially for a kids room! "I just got mine as well and need to carry it to the 3rd floor. Do the drawers come out? it's super heavy." Yes, the drawers can be removed. "what are the height / interior depth measurements of each drawer?" The measurements are approximately: Top: 18 1/8 inch wide x 13 1/8 inch deep x 3 5/8 inch high and Bottom (2): 18 1/8 inch wide x 13 1/8 inch deep x 6 1/2 inch high. "Purchased two in blueberry for my master bedroom. Just needed more storage than I had in my nightstands. Arrived well packed. Here is my question....do the drawers come out? They are extremely heavy and I cannot move them myself to the second floor if the drawers don't come out! They seem not to....but before I call my handyman, I thought I would check. Thanks." "Picture makes it look like it is slightly distressed. Is it?" I own the white one. it is a winter white with distressing only on the raised portions of all trim, knobs and legs. Not "over done" ..just right. love it! "Is the back of the product finished? Does the color carry to the back? Can it sit in the middle of the room?" No it does not carry around the back. I would only put it against a wal. "Is this nightstand assembled? " Yes. Comes completely assembled except for the feet. "Will the white option become available again? Right now I only see ebony, grey, and a few other colors. "